Is Nasi Lemak A Healthy And Balanced Meal? How Often Can You Eat It? Is The Malaysian Dish, Nasi Lemak, Really A Healthy And Balanced Meal? This article is dedicated to my fellow Malaysians. 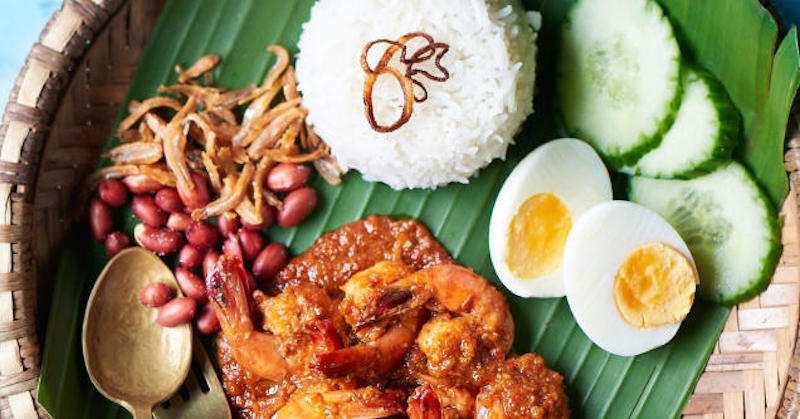 On 22 March 2016, The Star paper in Malaysia, reported that “Nasi Lemak” the staple Malaysian dish has been recognized as one of 10 most healthy international breakfasts by TIME Magazine. Nasi lemak used to be one of my favourite dishes when I was living in KL. I am now residing in Canada and of course, as a Malaysian in a foreign country, I initially had cravings for nasi lemak. 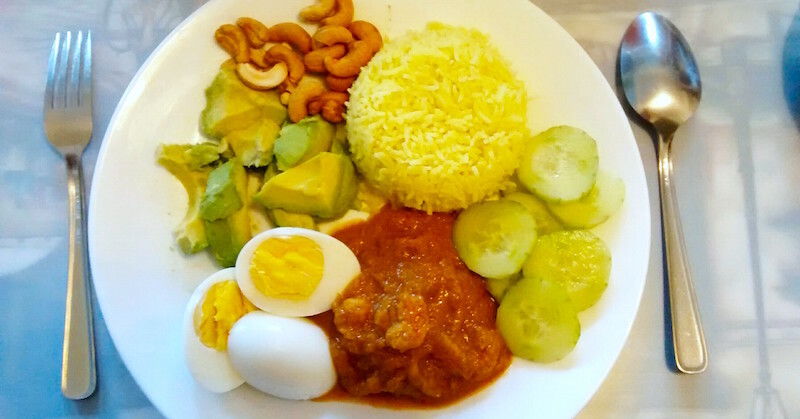 As I couldn’t find any Malaysian restaurant in the small town where I’m currently residing, I researched and created my own version of nasi lemak. Now I can cook the best nasi lemak in my small town here, and my husband and daughter agree! This article is not meant to teach you how to cook nasi lemak, but to analyze for you, whether nasi lemak is really healthy or not. You decide for yourself. I’ll break down the recipe and explain each ingredient used in preparing this dish. Health advocates say that white rice is high in carbs, therefore, is unhealthy. Yes, to a certain extent, but I would not totally condemn it. White rice is the staple food of Asians and we are not fat/obese. Westerners generally don’t eat white rice in their culture, yet more than one third of their population are obese. (Ref: “The China Study”). Contrary to what Malaysians had been taught, that coconut milk raises cholesterol—that’s not true. More and more researches are showing that coconut milk are healthy fats that actually lower the “bad” cholesterol level. Coconut oil is saturated fats, one of the most stable cooking oils that can withstand high heat. Coconut oil has many health benefits when consumed in its natural state, and doesn’t turn rancid when used for cooking. Understanding healing and harmful fats will make your nutritional understanding of food so much clearer. Onions or shallots: No problem here. Healthy. Onions are good for the digestive system. Dried and fresh chillis: Chillis help to boost metabolism and has a high content of vitamin C and antioxidants. Shrimps/prawns, or chicken: As long as they are not commercially farm-raised they are fine. Check with your supplier. Shrimps/prawns or free-range (kampung) chicken, are rich in protein and certain other nutrients. Belacan: This is a key ingredient in making nasi lemak sambal tasty. Here is a video on how belacan is made. Not totally hygienic yet I don’t believe any harmful chemicals go into the making of belacan blocks. Only a small amount of belacan is used to make the sambal. You decide. Tamarind sauce: This can be homemade (healthy) or used from a commercially-prepared bottled sauce with some artificial preservatives. Only about 2 tablespoons are used for cooking a small pot of sambal. Sugar: Most street nasi lemak sambal are sweet. A lot of sugar is used to achieve this sweetness. If you cook your own sambal, you may use jaggery (gula melaka) as a healthier substitute. Salt: Table salt is usually used for commercial cooking. For a healthier substitute, I would use Celtic seasalt that is rich in over 80 types of minerals that our body needs. Only a little salt is required. Eggs: Many Malaysians still avoid eating eggs or egg yolks, thinking that it is “high in cholesterol”. This is a myth. Eggs (especially from free-range “kampung” hens) are some of the healthiest foods that supply our bodies with good cholesterol. Cholesterol becomes harmful when it gets oxidized from the harmful cooking oil (see explanation above), and other processed/unhealthy foods that we eat. If you have to eat fried eggs, fry them in coconut oil, otherwise, hardboiled eggs for nasi lemak is best. Cucumber: Although bland, it is included to reduce the acidity of the dish (also eaten with satay to reduce the carcinogenic carbon). Cucumber also helps to reduce the oxidation caused by the cooking oil, although not enough cucumber is eaten with the dish to have an impactful effect. Peanuts: Health advocates will tell you that peanuts are not the best nuts to eat. I use cashew nuts for my healthy version of nasi lemak. Anchovies (Ikan bilis): I love those crispy anchovies and they are rich in protein, calcium, iron and many other nutrients. But then again, the cooking oil that they are fried in makes it unhealthy. I use coconut oil for all my cooking. How Often Can I Eat Nasi Lemak? Are you eating out a lot? Consider the harmful cooking oil that is used in all that cooking. Even when eating at home, what cooking oil do you use? Switch to coconut oil. Do you eat a lot of fresh fruits and vegetables (or drink fresh juices)? These foods are alkalizing and help to neutralize free radicals (oxidants). Are you generally living a healthy lifestyle and exercise regularly? Excessive exercise can cause oxidative stress in the body. Do you live a rather “stressful” lifestyle? Stress can cause many untold health problems in your gut that is your immune system. Do you drink sufficient water daily for your body size? Drinking insufficient water may cause dehydration that leads to many health issues in the long run. Having said that, I’ll be honest and say that I love my nasi lemak and eat it every now and then (not often). My diet and lifestyle are generally healthy, and I do my occasional juice cleanses and detox. So, there is always a give and take. The choice is yours. Adding some steamed kangkung or spinach adds a complementary flavor, texture, and nutritional component.